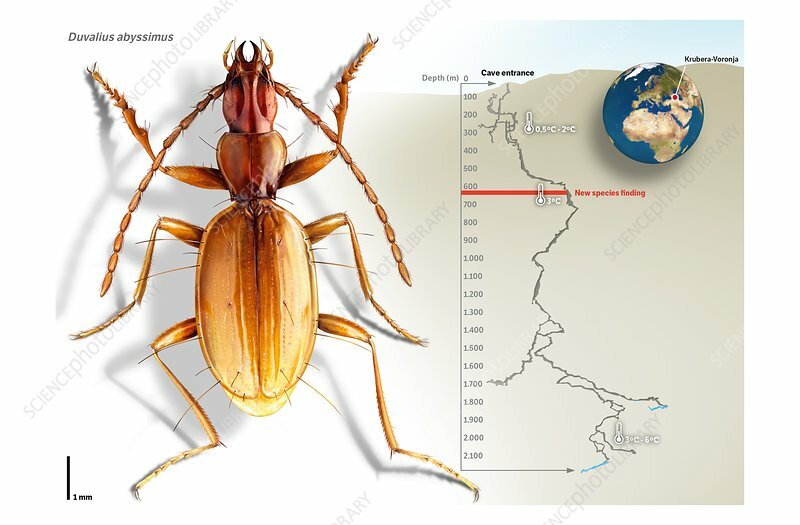 Duvalius abyssimus cave beetle discovery, illustration. This beetle was first described in 2014. It was discovered in 2010 and 2013 during expeditions to the Krubera-Voronja cave complex in Abkhazia. This beetle is 6 millimetres long, has no wings, cannot see, and has no body pigment. The the discovery site (diagram at right) is shown as more than 600 metres below ground, at a temperature of 3 degrees Celsius. These caves are among the deepest in the world.